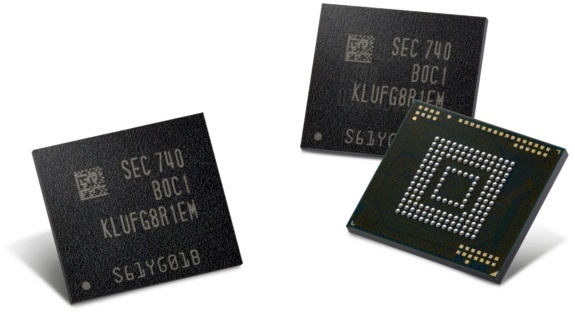 The new Samsung 512 GB eUFS embedded memory is about eight times faster than a typical microSD card, providing up to 860 MB/s sequential read speeds and up to 255 MB/s writes. More than a year ago, Samsung announced that the mass production of the new 256 GB UFS storage modules had begun. Although most flagships stop at 128 GB these days, the tech giant continues its push in this market by starting to manufacture the first 512 GB eUFS embedded storage solution. Earlier today, Samsung revealed some technical information about the new flash memory for next-gen mobile devices, advertising it as "the best embedded storage solution for next-generation premium smartphones by overcoming potential limitations in system performance that can occur with the use of micro SD cards." The new 512 GB eUFS storage solution uses 8 of Samsung's latest 64-layer 512-gigabit V-NAND chips and a controller chip, thus doubling the density of the previous 48-layer V-NAND-based 256 GB eUFS while using the same amount of space. According to the official press release, "Samsung intends to steadily increase an aggressive production volume for its 64-layer 512Gb V-NAND chips, in addition to expanding its 256Gb V-NAND production." Obviously, these chips are being used in more than just mobile phones, since SSDs and high-performance removable memory cards also take advantage of their performance and reliability. In the end, this new storage solution helps Samsung to keep its comfortable lead in the flash memory market, but this does not mean we are going to see flagships with 512 GB of internal storage space anytime soon. If you think otherwise, please share your thoughts with the rest of us in the comments!